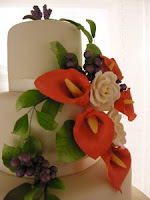 Weddings in Sedona in the Fall are a spectacular sight to see. 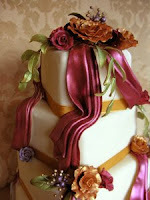 The beautiful rich jewel tone colors of Sedona are the choice of many brides when designing a cake for a Sedona wedding. 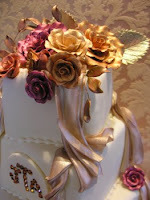 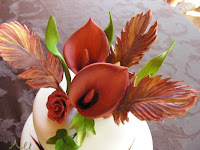 In addition to the flame cala lilies, this bride chose to add sugar feathers to her cake.